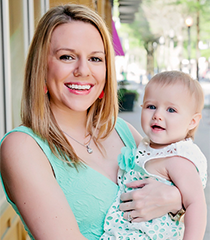 I still think of Maddie Grace as a baby, but more and more people are starting to refer to her as a toddler so I guess at some point I just have the accept that we have moved up and are now looking at activities to keep a toddler happy all summer long. Anyways summer is here and the days are long, hot, and lots of time here full of thunderstorms. We need a variety of activities, indoors and out, to make it through. Luckily we’ve found some awesome products and brands that are making this summer a blast so far! 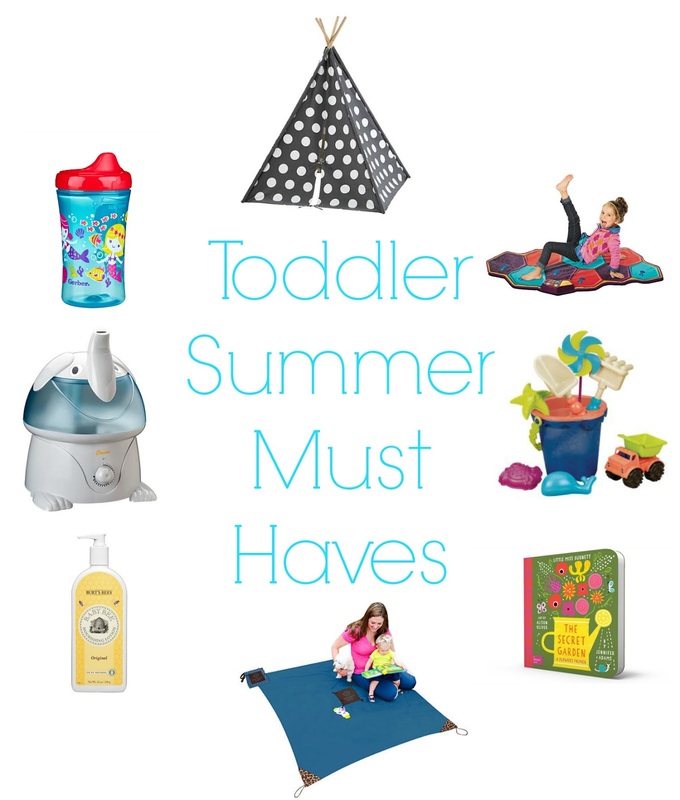 So what are these must haves if you have a little one? 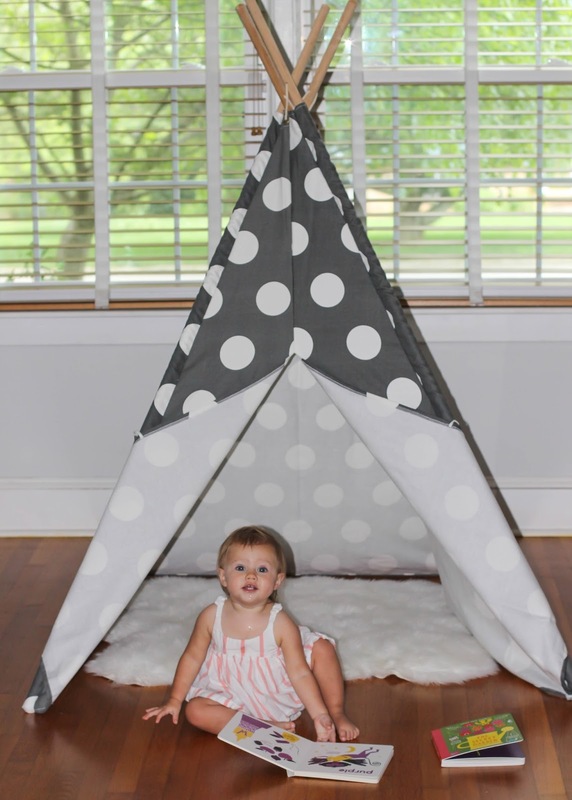 If you have a toddler, you need a Land of Nod TeePee. This is a great indoor activity to use for a break from the heat or on those rainy days. Maddie Grace is obsessed with her teepee and pretty much thinks that it’s the best thing ever. She loves to take a snack and a book in there and chill out. I think it’s good for her to have a little space of her own. She also loves to play hide n’ seek using her teepee which is really freaking cute. This teepee looks great in our play room, and is so well made. I was also impressed by how easy it was to set up – I don’t think it even took me 5 minutes. It’s the perfect addition to our home that came at just the right time, and we will use it for years to come! 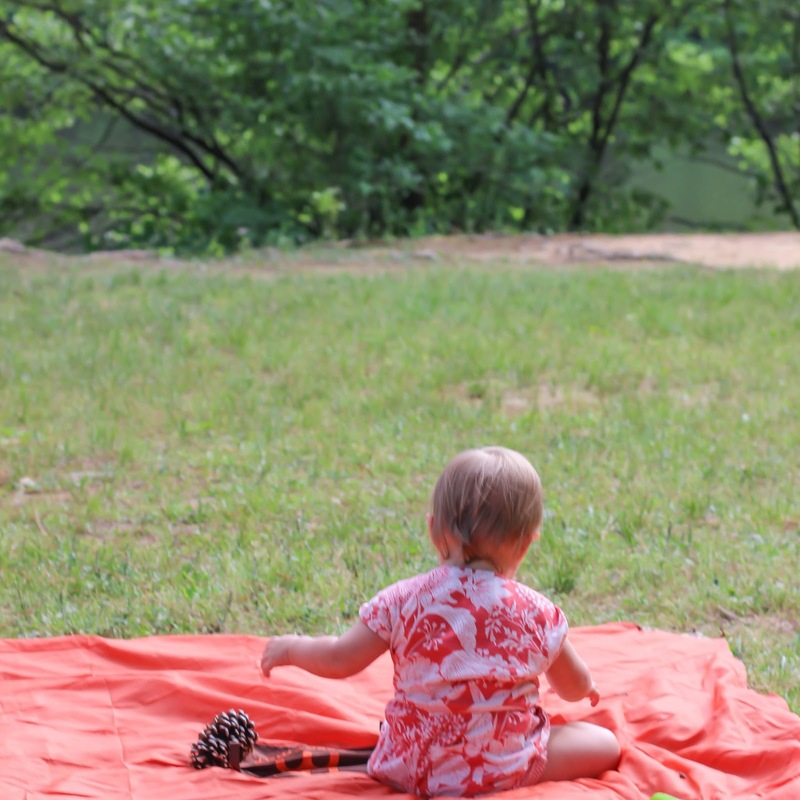 For the time we do spend outside I am obsessed with our Monkey Mat! It folds up amazingly small, is lightweight, yet is the perfect size mat for taking anywhere that we may want to sit down outside! It folds up into an attached pouch so you won’t lose any parts, has corner weights to keep it from blowing away, and tabs in the center for attaching toys or belongings that you don’t want to disappear. Once you get home you can wash it in you washing machine and it will be ready to go on your next adventure! We are going to need lots of toys, both indoor and outdoor ones, to keep our crazy girl occupied this Summer. I really love the creativity behind B. Toys. For Christmas I purchased Maddie Grace a musical instrument set from B. Toys which is easily one of the best toys I’ve ever bought her. I love seeing her grow musically and she loves playing her instruments. So to expand on that I went with the B. Mat-A-Matics (Musical Mat) for an indoor toy. It says recommended for ages 3 and up but Maddie Grace absolutely loves it. It’s basically a big keyboard that lays on the ground and stepping on different areas cause it to light up and play different notes. There is a control panel that makes different sounds and dance games for kids to play with the mat. Maddie Grace loves just stepping on the different areas and hearing what sounds it makes, she always starts laughing, and I know one day she will love all the dancing games with it too! 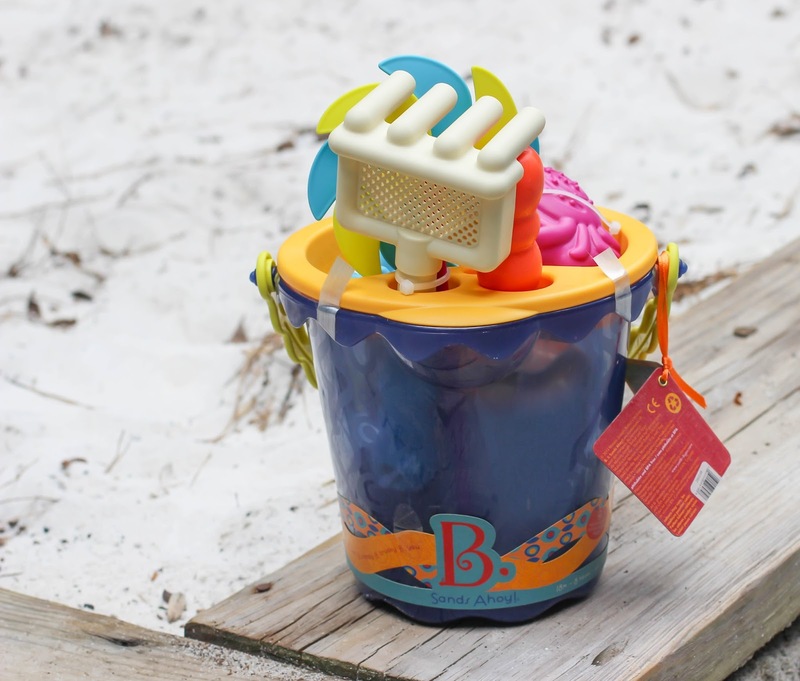 We also got the B. Sands Ahoy kit which is perfect for both the beach and the sand box at our pool! It comes with a pinwheel that MG is obsessed with, a monster truck, 3 sand molds, a rake, sifter and shovel all inside a cute bucket. Toys like this help toddlers to explore the world around them! 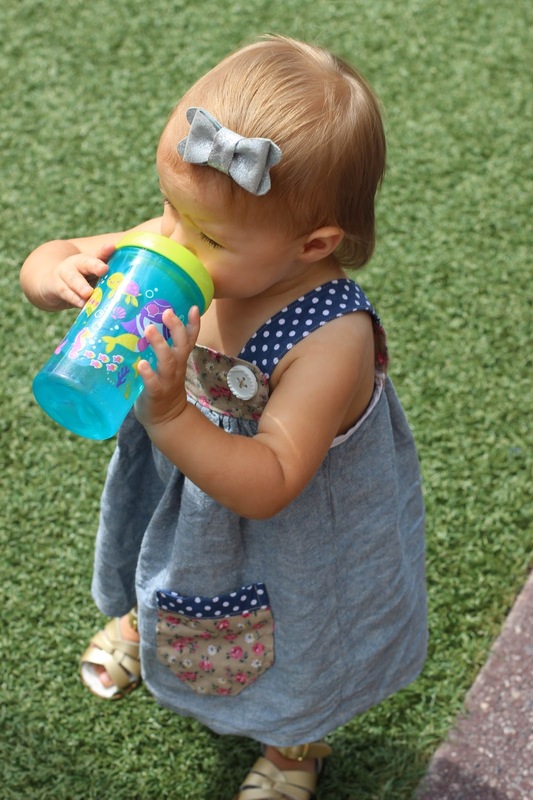 When it’s hot your little one needs a lot of hydration. And we all get annoyed by the cups that leak. That’s why I only use Nuk cups. So far they are the only ones I’ve found that don’t leak, plus I’m loving the fun Summer patterns. 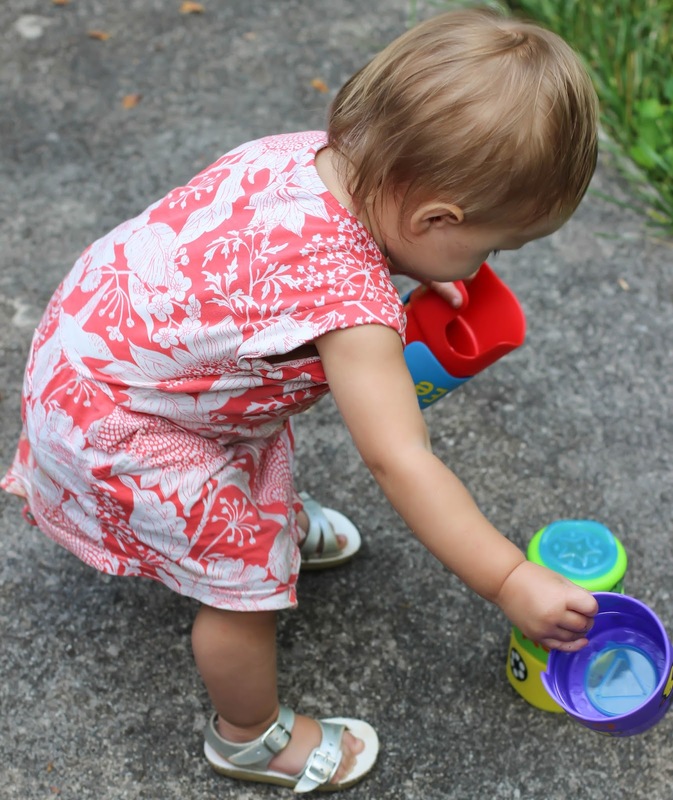 Our Nuk cups are coming with us everywhere this Summer! We’ve also been using a Nuk toddler toothpaste and toothbrush that is working great for us. Usually dry skin is associated with the winter, but my baby girl has had it bad this summer! That’s why we switched to Burt’s Bees and have been using their soap and lotion to help take care of her scaliness. I love that these products are naturally based and get the job done. 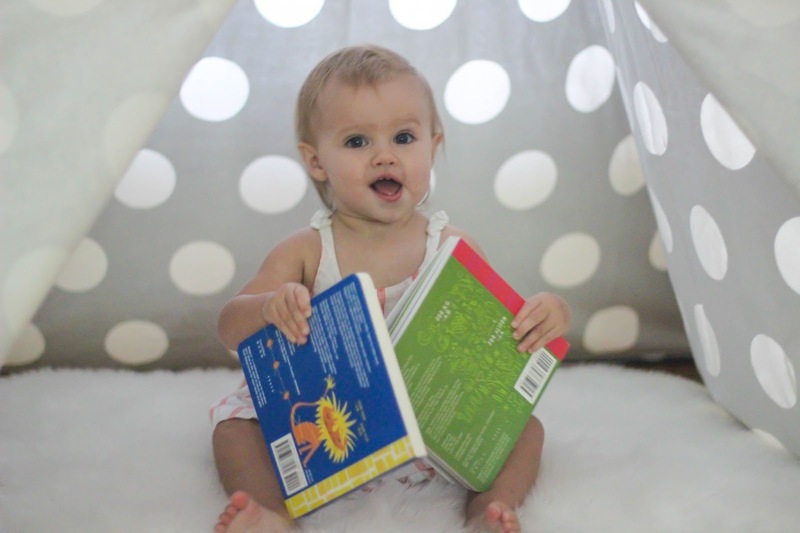 Summer is a great time for reading, even for toddlers. 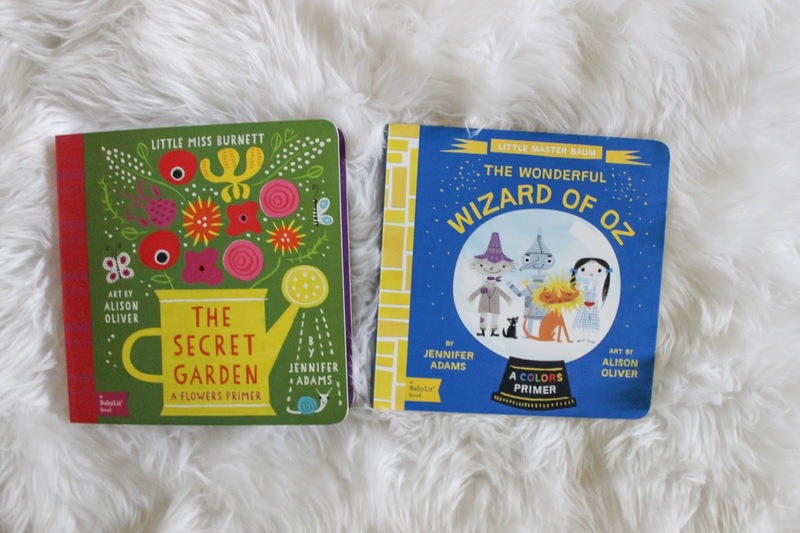 And Baby Lit makes the cutest books for little ones. We have several of them now and got The Wizard of Oz (a colors primer) and The Secret Garden (a flowers primer) specifically for this summer. Both have great pictures, and are the books Maddie Grace always reaches for. 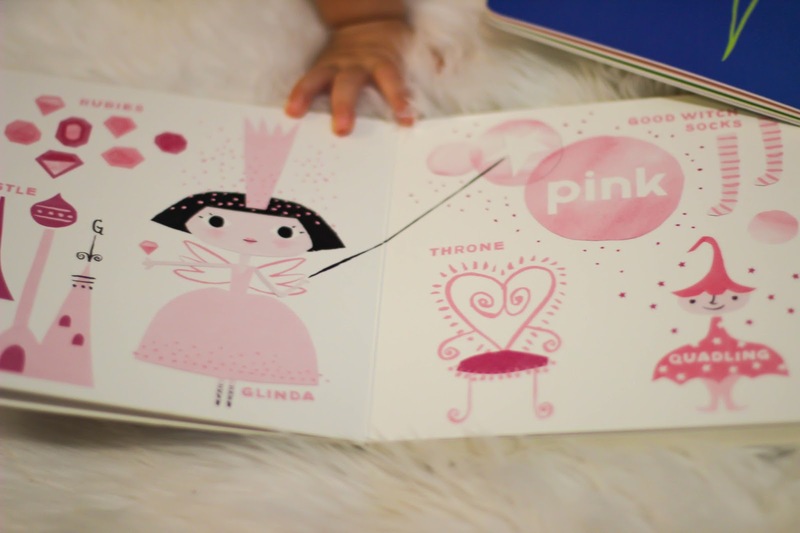 She especially likes the pink page of Wizard of Oz, as she always turns to it. I really think Baby Lit books have contributed to her love of reading so I’m going to keep encouraging her to read them as much as possible! Isn’t it humid enough in the summer? Not in our nursery. We need a humidifier running all night and I love how cute this Crane one is and how it fits in with our decor. Maddie Grace also loves looking and pointing at it during the day. 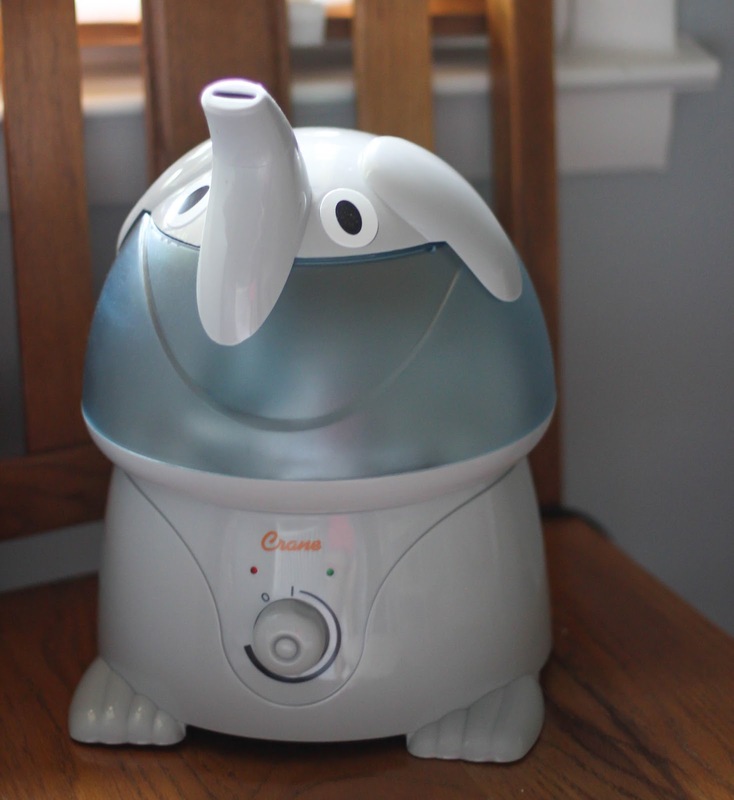 It’s also easily the quietest humidifier we have used which is perfect for a toddler who is a light sleeper. Melissa and Doug have so many toy options for both indoor and outdoor play that they are perfect for this time of year. MG’s favorite Melissa and Doug toy is the Smart Stacker, which we take with us outside and play with inside. She also loves pushing around the Froggy Kickball, and knocking over the pins of the Happy Giddy Bowling Set (she hasn’t quite figured out how bowling works though). And when all is said and done our little reader adores the Soft Activity Book which is also great for packing up and taking with us on the go. Did you see a few posts back where me and Happily Hughes are having a big giveaway that includes most of these products? What products are you thankful for this summer? What do I need to try? Let me know below! *I received complimentary product in exchange for this post. Regardless all thoughts and opinions are my own and I only recommend products that I truly love. I'm going to have to invest in one of those teepees! It's completely worth it 🙂 so much fun! 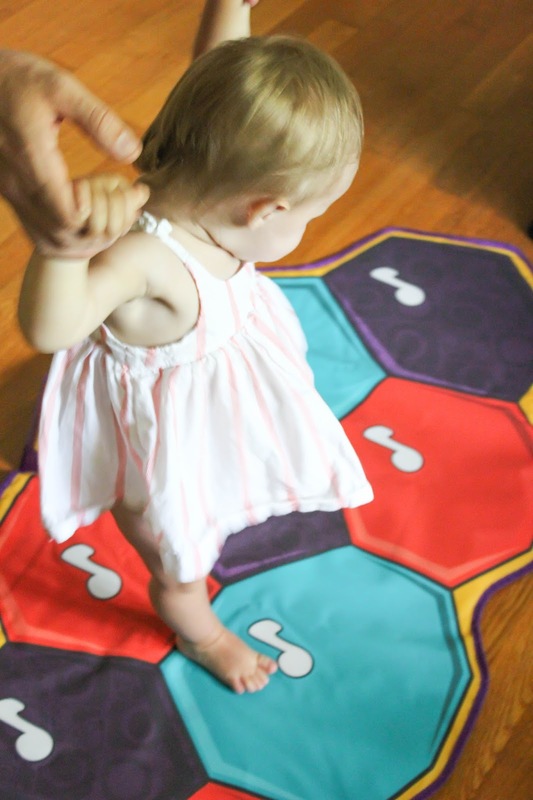 Our little one can't even walk yet and I am totally ordering her the musical mat! It's great! You should also check out the B. Parum Pum Pum Drum! I need a great new blanket! Thanks for sharing! 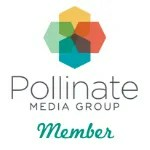 Seriously check out Monkey mat! It's crazy how light and small it is!! 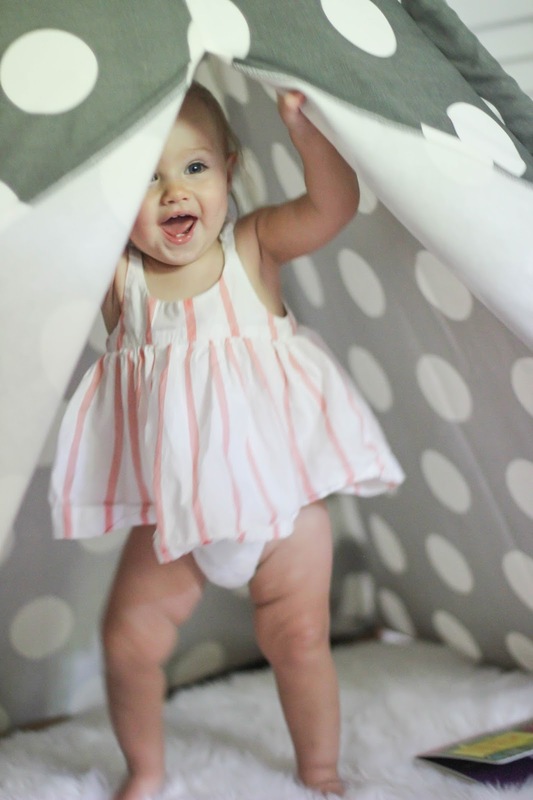 That teepee is so stinkin cute – and I love the picture of her peeking out of it, oh my gosh! We spend every waking minute outside in H's little pool right now! Thank you we love it clearly 🙂 Yes as soon as we are 100% better we are going back to our neighborhood pool and blowing up MG's little pool! Right?!? It's seriously the best! Thank you! You should it is so much fun! I too fought the toddler label for a long time, so you're not alone! And I ADORE those teepees…. but why are they so darn expensive!!!!? ?